Along with winter come household problems. We are not talking about your common burnt appliance. We are talking about something bigger than that. Your entire house, starting from your roof. In case you did not know this by know, winter can and will cause some damage to your roof from different angles. That is why you need to consult your local Michigan roofing companies and see what is to be done. The cold weather usually deteriorates the quality of the products that have been used on your house. The roofing materials are the most exposed in this time of the year. You might think that it should not pose a big threat, but in reality, the outcomes show up in later summers and beginning of autumns. In extreme cold temperatures, some materials tend to crack. In terms of roofing materials, we are talking about shingles, tiles and even boards. The most common materials that suffer extreme damage are the asphalt shingles and clay tiles. The texture is usually tested at maximum and minimum temperatures in order to provide the buyer with more information. The truth is that everything varies. On the label, it can say resistance to a minimum of -4 degrees. However, those conditions do not include frost or frozen rains. Those are the real problems when it comes to extreme weather. Because of that, many homeowners need to replace parts of the roof every 2 years. Lucky for you, there are ways to avoid such problems. For starters, you will need to inspect the interior of your roof. Go into the attic and compare temperatures. 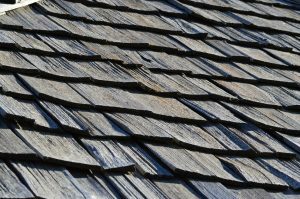 If you feel a big difference in certain spots, then there is a big chance that you are losing room temperature due to damaged shingles or tiles. The best way to spot them out is by taking a piece of napkin and place it where you feel colder temperature. If you see it move, then you have a problem that needs immediate repair. Another good way to spot out roofing problems is by watering it down with the garden hose. If you do have holes or broken pieces, you will notice small leaks on the inside of your roof. To take care of them, simply replace the broken piece or seal the hole with a special kit that can be found in any hardware store. However, we did say it is better to be safe than sorry. This means that it is better to take extra precautions. Before the cold season settles in, make sure that you apply a “treatment” that will last you the whole winter. Look for water proof solutions designed especially for roofs. You need to spray them on before the first snow. The chemicals will give the roof a protective layer that will not allow snow or water to settle on the roof. According to roofing East Lansing experts, this type of maintenance is guaranteed to save you a lot of time and money. So, make sure that you talk to Michigan roofing companies to spend Christmas in a warm, comfy your home and not worry about the harsh temperatures outside. timbalfe.com content © Copyright 2019.